Lameness can be an equine owner's biggest bug-a-boo. A horse that is lame not only suffers physically and mentally, but also cannot do the work that helps maintain physical health and a sense of well being. "He feels off" is the common saying of the horse owner who suspects a lameness issue. A rider can feel it, an experienced owner can see it. Often the signs of lameness are perfectly obvious. The horse has a decided limp, or the horse holds one hoof off the ground and refuses to move. Other times, detecting lameness takes a trained eye and an intimate knowledge of the horse and the way it moves. Sometimes lameness is so subtle that the rider doesn't realize the horse is lame until a savvy observer notes a slight break in the gait or uneven hoof prints on the trail. Early detection of lameness will prevent further injury to the horse's rather delicate bones, tendons, ligaments and foot structures. Since lameness can be the result of infections, degenerative and metabolic diseases, developmental conditions, and mechanical malfunctions, it may be impossible for a layman to discover the cause. 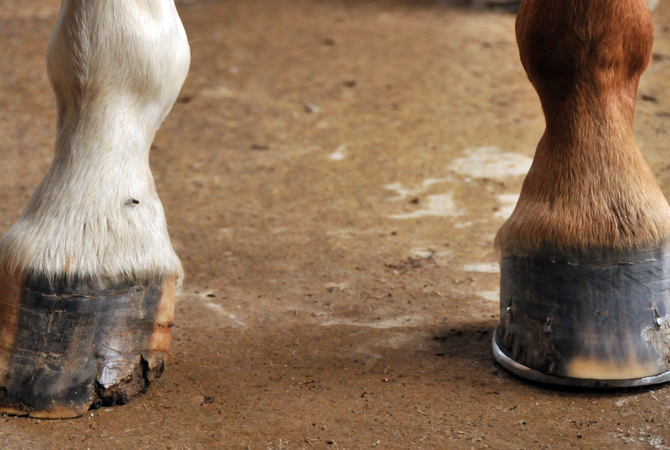 In some cases, your farrier can discover the cause of lameness and treat the problem, especially if the problem originates in the horse's foot. In other cases, it may take tests and diagnostic imaging as well as an examination by your veterinarian to discover the location and the root cause so that treatment can begin. Observe your horse carefully after riding or exercising to determine if the horse is moving in a comfortable and smooth fashion. If not, examine the frog and sole of the foot for bruises or foreign objects and pick the hoof if necessary to see the clean structure. Also, watching your horse while someone else walks or rides it will enable you to make sure the horse does not show any signs of lameness.